A software update is now available that introduces new features and adjustments to enhance the overall experience. Please start the game while your Wii U console is connected to the internet to update the software. The software version after this update will be 1.1.0. Adds ability to purchase new add-on content. 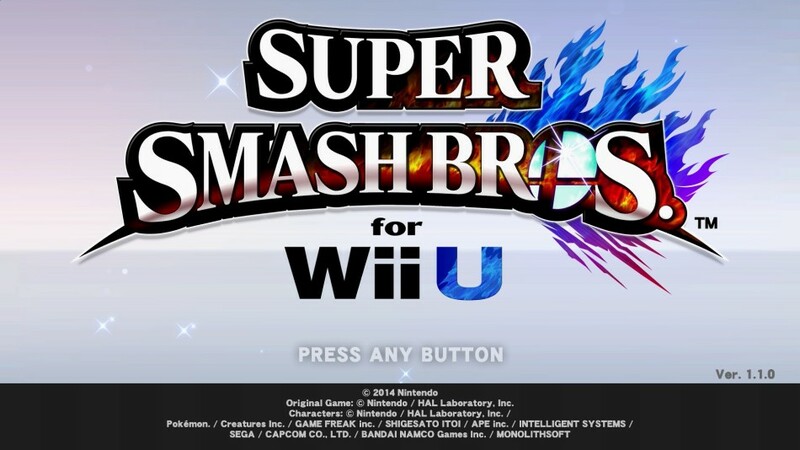 Please visit the official Super Smash Bros. website for more information about purchasable add-on content. Adds ability to create your own Tourneys. You can post and read about Tourneys in the Tourney Community on Miiverse. Adds ability to post replay videos to YouTube. Replays can be posted to YouTube and the Replay Viewing Community on Miiverse. Note: You can only post replay videos you created yourself. A Google Account is required to use this feature. Please note: a minimum of 2.5 GB available storage is required to perform this software update. Depending on the Wii U hardware pack you own and your use of it, an additional storage device may be required. Please visit our Storage section for details about additional storage devices. In addition, you will be unable to play replays created in version 1.0.9 or below. This update is also required in order to access online features of the software.